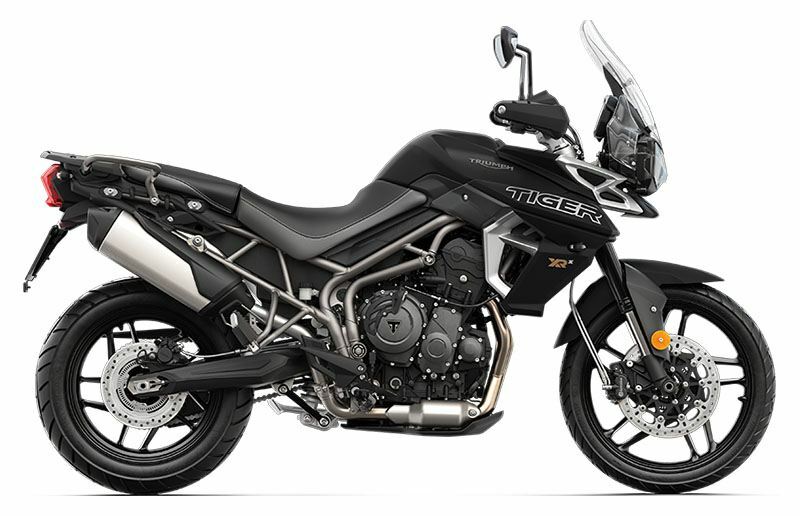 The new road-loving Tiger 800 XRX is an easy-handling adventure bike that’s perfect for touring the world’s highways, crossing city streets and also ideal if you are off the beaten track. The XRX is a ride with a smooth delivery and a performance that generates self-assurance and poise. It features a more responsive Triumph 800 Triple engine, lighter exhaust system, new full color TFT instruments and switchgear, new five-position screen and four riding modes are just a few of the many features designed into this latest generation XRX. The 19-inch aluminum cast front wheel and Metzeler Tourance tires work together with the dynamic systems and new riding position of the XRX to ensure an enjoyable comfortable all-road ride. You’ll immediately notice the control gained from a new shorter ratio first gear, giving you more low-speed traction and instant responsiveness right when you need it most. All this is in addition to the category-defining core technologies, including ride-by-wire throttle, and new premium Brembo front braking system. 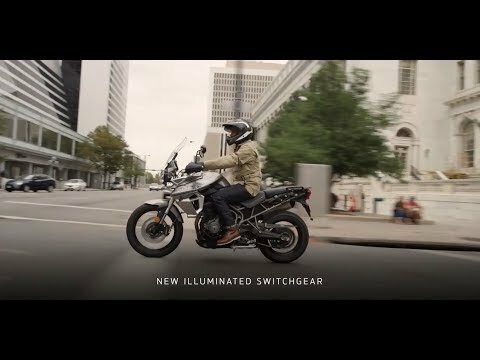 The new Tiger 800 XRX delivers a full-on road focused adventure every single day. MORE RESPONSIVE ENGINE: The thrilling new generation, mass-optimized 800cc Triple engine delivers 95PS and features even more responsiveness, acceleration and character. 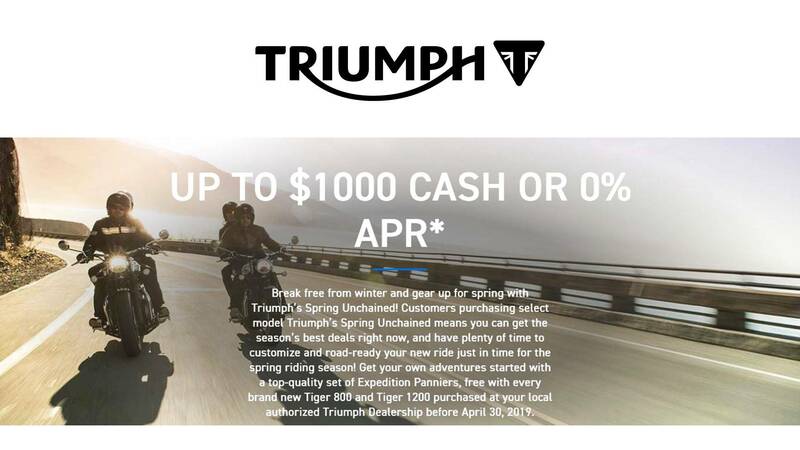 STATE-OF-THE-ART TECHNOLOGY: Packed with rider-focused technology, including Triumph’s signature Daytime Running Light (DRL) system, new full-color TFT Instruments, new ergonomically designed switchcubes and 5-way joystick, updated cruise control, four riding modes, and heated grips. RIDING MODES: The adventure-ready XR model now has four riding modes available including; 'Rain', 'Road', ‘Off-Road’ and 'Sport' modes, the new XR is ready to take on any challenge. NEW BREMBO FRONT BRAKES: The new twin Brembo front braking system on the Tiger 800 XC delivers premium braking style and capability. WHEELS & TIRES: The new Tiger 800 XR is fitted with Metzeler Tourance Next tires and a 19’’ cast front wheel, providing confidence-inspiring traction and control in a range of environments. ERGONOMIC IMPROVEMENTS: Practical enhancements offer an altogether better ride; including new five-position adjustable screen and aero deflectors, a more comfortable seat compound, and a new handlebar position to improve control both off-road and on. ADJUSTABLE SEAT HEIGHT: The Tiger 800 XR features an adjustable ‘2 position’ seat mechanism allowing the rider to lower seat height by 20mm from 830mm to 810mm to suit their individual riding style and preferred position.